July 4th means cookouts, picnics, parades, fireworks…and lots of food! We usually head over to Aunt Mary Ann’s house by the water. It’s always fun (and embarrassing to the kids) when the aunts sing “God Bless America” at the top of their lungs. But this year, we are hosting. I get to see my sister, bro-in-law, cute little niece and their new puppy (my kids are going to love this!). I’m making the menu and shopping list now. Woo hoo! I’m a bit of a nerd that way; when it comes to food and entertaining, I live for it! To save time, I made a red, white, and blue dessert and put it in the fridge today. We’ll have it after watching fireworks. Can I tell you I couldn’t stop licking the spoon? In fact, after a few hours, Kate dug it out of the fridge, and well, let’s just say we couldn’t wait until Thursday after all. 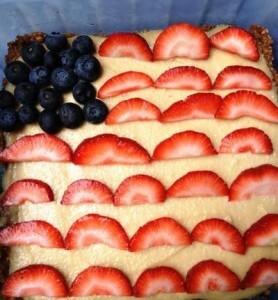 Aunt Mary Ann makes a special American flag cheesecakes so I made one, too. 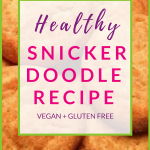 Mine is a healthy twist to the traditional cake with nuts, tofu, and shredded coconut. Drain cashews and add them to the blender with the rest of the ingredients. Pulse until everything is smoothly pureed. Then pour into the pie crust. Spread it evenly, making a nice swirl with the spatula. Bake for 40 minutes at 250 degrees F. Remove from oven and let cool. 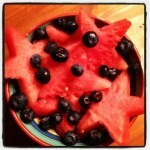 Add blueberries and sliced strawberries to make the flag. Keep it stored in the fridge until ready to serve. It is safe for about 3-4 days, and make sure to cover to keep in the freshness. Your turn. How do you work the red, white, and blue for the 4th? I am making to make red, white, blue popsicles. 3 layers – pureed raspberries (maybe add a little honey or maple syrup), coconut milk, pureed blueberries. Have to freeze in stages but should be delicious and the kids will love them! I am totally making this because, well, me too!! Scary, I have almost all of the ingredients on hand. You have changed my life, Lisa! Love it! Miss you and love seeing Miss. K in your posts. Love that girl!!! Jen! I just LOVE you! And Miss Kate does too…she misses her coach. She told me the other day she is going to have a GOTR inspired wedding cake. Not sure why we are talking weddings at the age of 10, but she is thinking the color scheme of greens and pinks. Ha! 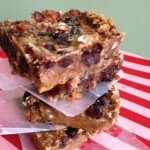 You need to make this…it’s sweet but light and I sure hope I don’t eat it all before Thursday. We need a get together soon. Hugs! Oh Lisa! You have the BEST recipes and tips everrrr. I loved this post! I cannot wait to try it. Thank you so much for all you do to inspire us to stay healthy! Thank you so much for your kinds words, lovely lady. I hope you make this for realz…in fact, it’s sitting in the fridge now calling my name. I have a feeling my guests won’t have any to taste on Thursday! Hugs to you! She is a sweetie, Sharon. Hope you try this cheesecake! Happy 4th!